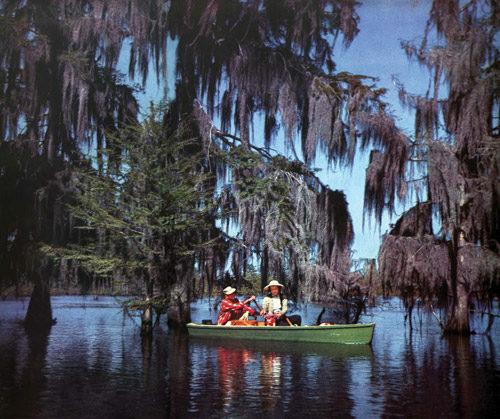 Beneath gray shrouds of Spanish moss, a Cajun couple paddles across the dark, still waters of Bayou Chicot. This photo and description was part of a regular feature in The Saturday Evening Post from the 1950s called “The Face of America,” which captured a rarely seen view of American life. Beneath gray shrouds of Spanish moss, a Cajun couple paddles across the dark, still waters of Bayou Chicot. Overhead, the boughs of gum trees and tall cypresses shield them from the Louisiana sun. It is a pleasant spring Sunday here, about 75 miles (as the crow flies) northwest of Baton Rouge.